Whether you’re setting up a tent on a perfect summer night, or on a crisp fall day surrounded by stunning foliage, it’s almost always a good time to camp in Connecticut. Camping allows you to enjoy hiking, fishing, and nature over three seasons. So, pack up your gear and get ready to spend time at one of these 15 great campgrounds. Pachaug State Forest is the largest state forest in Connecticut and it is surely stunning. It covers over 24,000 acres and has numerous beautiful areas to hike in including the Rhododendron Sanctuary. Pachaug State Forest has two designated campground areas including Green Falls and Mt. Misery. These campgrounds have different seasonal opening times, so be sure to check online before settling on a spot. Hunting is permitted in nearby grounds, so do keep in mind to dress in bright colors for safety reasons. Alcohol is not permitted at campgrounds. Hammonasset Beach State Park is open for camping from the end of May until mid-October. This huge campground has 558 camping spaces with amenities such as a concession stand, dumping station, and bathrooms with showers. Swimming is also permitted on the beach. Reservations can be made online for most of the season, if necessary. Open from early April until early September, the Macedonia Brook State Park is an alcohol-free campground with over 50 campsites. Facilities on-site include pit toilets, water pump, and trash and recycling stations. Campsite rental prices are reasonable for Connecticut residents with only slightly higher fees for non- residents. Kettletown State Park, located along the Housatonic River, is a popular hiking, camping, freshwater fishing, picnic, and swimming location in Southbury. Kettletown boasts 56 camping spaces in open and wooded settings and amenities include dumping stations and bathrooms with showers. If you don’t want to camp in a tent, rustic cabins are also available for rent. Alcohol is not permitted. The West Thompson Lake Campground is located along the West Thompson Lake in a wooded natural area. Being located right on a huge lake makes this a great spot for kayaking, boating, fishing and hiking. A small camping area includes 11 campsites with electric and water hookups, if needed, and 11 basic sites without water or electric hookups. Flush toilets, showers, safe drinking water, and a dump station are available on-site. Devil’s Hopyard is a cool state park with a waterfall and interesting rock formations known as Scotland Schist. Camp near the scenic waterfall in one of 21 wooded campsites. Campsites per night only cost $14 for Connecticut residents making it a great, affordable place for camping. Stream fishing, hiking, birding, and bicycling are also permitted at Devil’s Hopyard. Indian field is a long-term rental campground that provides electricity, well water, laundry facilities, dumpsters, free Wi-Fi, and much, much more. This is a family-friendly campground located on Gardener Lake. Long-term residents are also welcome to purchase campground homes. Odetah offers a great camping experience for both first-time campers and experienced campers. This campground features lakeside as well as wooded sites for tent campers and those who wish to rent a cabin, yurt, or bring their own RV. Amenities include seasonal rentals, hook-ups, water and electric, swimming pool, basketball and tennis courts, and more. Little City Campground has 50 sites and their season runs from May 1 until Oct. 1. Bring your own camper or tent and relax on the wooded grounds of Little City Campground or head out to explore the nearby towns. On-site recreation at Little City Campground includes a recreation hall, swimming pool, fishing, and hiking. Good news for pet lovers! Two pets are allowed per campsite rental, making this a great spot to bring your dogs camping. There are a total of 71 tent and RV sites available for rent at Salt Rock campground. Amenities include bathrooms, showers, a swimming pool, dumping station, and hookups for some of the sites. This campground is slightly more expensive than many of the other campsites in Connecticut at a nightly rate of $33 for Connecticut residents for tents, but it also has more economical weekly rates. Wolf’s Den campground offers the opportunity to rent on-site trailers for campers looking to try camping for the first time for those considering purchasing a trailer for themselves. Trailers at Wolf’s Den are equipped with kitchens, air conditioning and have all the comforts of being at home. Wolf’s Den’s events calendar is full of fun events taking place nearly every week of the camping season from May until the end of October. Rent a rustic cabin and enjoy some comfortable camping at the American Legion State Forest. This state forest has 30 wooded sites and boasts a dumping station, bathrooms with showers, and one pet per site is allowed. Near the camping site, you’ll also find an area for fishing, but swimming is prohibited. Keep in mind that hunting is allowed near the American Legion State Forest, so consider dressing in bright colors. Lake Waramaug Campground is open each year from late May until early September. It has 71 wooded and open campsites near a lake as well as six cabins available for rent. Camping spaces are all clustered near each other and are very close to Lake Waramaug where you can swim, boat, or fish. Canoe and kayak rentals are also available if you don’t bring your own. Black Rock Campground is open from early April until early September and has close to 100 wooden and open sites with four cabins available for rent. At the beautiful Black Rock State Park, you can fish in streams or ponds, swim, or hike. Note that pets are not allowed at this campground. 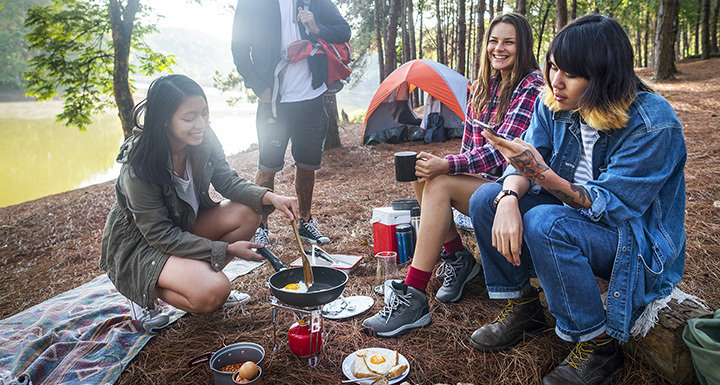 Spend some time outdoors with your family, friends, or pets at one of Connecticut’s great campgrounds! From camping rentals that make you feel like you are in the comfort of your own home, to a more rustic stay, get close to nature while swimming, hiking, or fishing at one of these 15 campgrounds in Connecticut.